The Central Belt is in Scotland, one of the four countries that make up the United Kingdom of Great Britain and Northern Ireland. It is that part of the country which stretches from Glasgow in the west to Edinburgh in the east, and contains the majority of the population. 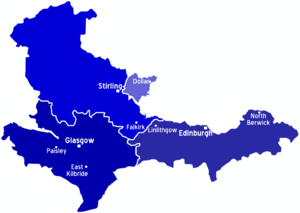 The region varies greatly, from the cities of Glasgow, Edinburgh and the ancient capital, Dunfermline, to the rural areas of the South Region. Elderslie This is a small village situated between the towns of Paisley and Johnstone. It is the birth place of William Wallace. Caldercruix This is a small village situated between the towns of Airdrie and Bathgate. It is the birthplace of Iain Randall. There are three major airports in this area of Scotland. One serving the capital, Edinburgh, and two serving Glasgow. Trains from England arrive in the main rail stations in Glasgow and Edinburgh. ScotRail  currently runs the rail franchise in Scotland. East Coast  and Virgin Trains  also run passenger rail services in Scotland, but they operate long distance services and only stop in the larger rail stations. This page was last edited on 25 April 2018, at 17:07.